Spectrum Health System monitored productivity to detect issues affecting outcomes. 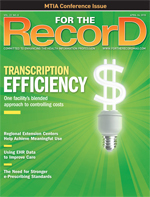 When senior leadership approached Michael Putkovich, RHIA, director of HIM at Spectrum Health System, about ways to reduce transcription costs, it gave him the opening he needed to step up exploration of how well speech recognition would fit with the seven-hospital system’s processes. For the Grand Rapids, Mich.-based system, converting to speech recognition was no simple matter. Spectrum was utilizing an analog system, making it necessary to migrate to a digital set-up to take full advantage of the flexibility and enhancements that could be realized from the technology. An enterprisewide solution was also needed to eliminate the need to support multiple systems. As such, it was imperative to determine when front-end speech recognition was appropriate and when back end was the better option. To ensure all stakeholders had a voice in the process, Putkovich assembled an evaluation team that included representatives of the health system’s 1,400 physicians and 80 transcriptionists—the two stakeholder groups that would be most impacted by the conversion. They issued a request for information and then conducted an exhaustive review of the offerings from responding vendors. Ultimately, front-end speech recognition from 3M Health Information Systems was deployed in all intensive care and nuclear medicine units, where clinical workflows and processes are most amenable to the technology. Templates were also created to further streamline use of the front-end technology, which uploads the information directly into Spectrum’s Cerner EHR system for real-time access and use. “With front-end speech recognition, we’ve brought consistency of documentation, taken illegibility out of the mix, and enhanced professional billing processes,” says Putkovich. Spectrum also deployed 3M’s back-end speech recognition in those areas that were not well suited to front end. The initial focus was on converting physicians who were the highest volume dictators and now, less than two years into the migration process, more than 500 physicians are utilizing speech recognition for more than one half of all dictation. Even with an adoption rate below 100%, Spectrum has realized a sizable return on its investment into speech recognition. Annualized savings from the back-end solution are $410,000 per year based on cost avoidance from elimination of line fee charges levied by other hosted solutions and cost savings from enhanced productivity and decreased outsourcing needs. The system has also gained the equivalent of 4.4 full-time transcriptionists and nearly 480,000 total annual minutes. The conversion has also benefitted Spectrum in the form of improved compliance. This is especially true in nuclear medicine, where the Intersocietal Commission for the Accreditation of Nuclear Medicine Laboratories guidelines dictate the timing of reports, electronic tracking, etc. The top-down push to reduce transcription costs without impacting quality isn’t unique to Spectrum. The heightened focus on transcription costs is driven in part by a projected 44% increase in dictation volume, which KLAS, in its 2009 report “Transcription Services: Steady Demand in a Volatile Market,” attributes to an anticipated growth in patient volume and greater documentation requirements for physicians. Despite that increase, the KLAS report found 16% of surveyed hospitals were planning to use fewer outside services, a result attributed to the increased use of EMRs and speech recognition software. But speech recognition isn’t for every facility. According to Bob Thomas, a transcription and HIM consultant, the environment in which dictation takes place can make or break speech recognition. Deploying speech recognition technology isn’t the only way HIM directors can cut costs without sacrificing quality. If the majority of their transcription is handled by an in-house team, they may want to weigh the pros and cons of sending transcriptionists home to work remotely. Retz also notes that ensuring the proper interfaces are in place to provide transcriptionists with automatic insertion of the patient demographic data is also a good way to reduce costs by streamlining efficiencies. An integrated transcription system can also reduce costs by enabling transcriptionists to “use a keyboard shortcut to save their current document and get to their next job in one step. It saves keystrokes and makes the transcriptionist more productive … by eliminating extra steps,” says Retz. Outsourcing is another viable alternative, though the greatest benefits will be realized by hospitals that are set up to exchange information electronically. Otherwise, any cost savings can be quickly consumed by the process of manually managing records that have been submitted in hard copy form. For example, if information is being faxed from the facility to the transcriptionist, valuable time may be lost in creating the electronic document from scratch. “Once the document is complete, what are the efficiencies for getting it back [to the facility] electronically? How can the document be fed back into the system? Can efficiencies be gained at the beginning, during the process, and after? Those are some areas I would look at,” says Thomas. Offshore outsourcing is also growing in popularity as a strategy for cutting transcription costs. KLAS reports offshore companies charge an average of 13 cents per line compared with 15 cents for onshore services. As a result, 43% of hospitals were utilizing an offshore transcription service in 2009, up 35% over 2008 levels. But offshoring comes with its own set of problems, including quality and the speed of turnaround times. Thomas notes, in some cases, it’s a 3-to-1 difference in transcription productivity between onshore and offshore vendors. HIM directors should also be aware that some outsourcing vendors may subcontract work to offshore transcriptionists as a way to keep costs low. It’s important to know whether this is a possibility, as many organizations have policies that prohibit access of personal health information (PHI) by foreign entities. “If you seek proposals from several vendors and one appears surprisingly lower than the others, that vendor may be using offshore labor. While offshore labor may be as effective as onshore labor, many organizations prohibit their PHI from being accessed by citizens of foreign countries, regardless of the safeguards the vendor may establish,” according to Rose T. Dunn, MBA, RHIA, CPA, CHIPS, chief operating officer of First Class Solutions, Inc, a consulting firm specializing in HIM. When faced with the need to reduce costs while maintaining quality levels, HIM directors have options that don’t entail new technologies or sending transcription outside the facility. In fact, while outsource firms can often transcribe at a lower rate, Dunn notes that outsourcing may still not result in cost reductions. “A fine-tuned HIM transcription operation may be as cost-effective as an external firm and provide for a consistent pool of labor serving your medical staff or other authors and higher degrees of accuracy overall,” she says. However, if hardware or software is old or outdated, peak efficiencies and cost reductions will not be achieved. In those cases, the answer may be an upgrade that reduces technology downtime and/or takes advantage of functional enhancements such as the autopopulation of data fields. Any of these changes can have a significant positive impact on productivity, accuracy, and costs per line or report. If an outsourcing arrangement is already in place, it may be worthwhile to review the contract to see whether any cost-cutting changes could be made. This is most feasible if the existing contract is not long-term or exclusive or does not commit the vendor to delivering a set level of lines, minutes, or reports. “If your vendor’s contract can be modified or if your transcription is performed in-house, consideration could be given to making reasonable modifications to the unit measures,” says Dunn. “For example, if the system automatically populates the demographics once the transcriptionist enters the account number and/or creates footers and templates once the report type code is entered, then technically neither the vendor nor transcriptionist should be credited for these characters and/or lines. However, credit should be given for the keystrokes involved in entering” that information. Dunn suggests potential cost reductions could also be found in how the line is counted. HIM directors may want to consider applying the recommendations from the AHIMA and the Medical Transcription Industry Association Joint Task Force on Standards Development. “However, be certain that you have a method to validate the line count provided by your vendor,” she adds. Retz also recommends instituting best practices to improve and accelerate the actual dictation process, such as clarity in speech or establishing a specific dictation order. This can have a significant impact on productivity and quality. Standardizing document types can also reduce transcriptionist training needs and help increase productivity. Altering how productivity is measured (eg, measuring by the minute instead of by character or line) can also impact costs. Technology does play an important role when it comes to basing compensation and incentives on productivity rather than salary because it allows performance to be tracked “from the moment the transcriptionist selects a job to the moment they save the document. Once you give the HIM manager productivity tracking tools, they have the ability to work with their staff to make sure they are being as productive as possible,” says Retz. Regardless of the approach taken to reduce costs, Putkovich says success requires the ongoing monitoring of productivity to identify and correct any issues that may be impacting outcomes. For example, some physicians tend to be less organized with their dictation. This can slow down transcription and increase the need for extensive editing. When those physicians were identified, Putkovich and his team would work one on one with them to help them understand how their dictation style was impacting turnaround times. But the need for monitoring doesn’t end once a physician has changed dictation patterns. Putkovich says his department and the transcription leadership team is continuously tracking changes in physicians’ speech recognition rates to identify when a change may signal a need to intervene. It’s unrealistic to assume recognition rates will remain consistent over time. For example, a physician who is rushing through dictation because of a particularly hectic schedule or one who is stressed is likely to experience a one-time, temporary drop in recognition rates. However, “If we see a trend starting that the recognition is going down consistently, that will throw up a red flag that we need to reach out to that physician,” says Putkovich. He notes another critical factor in the successful reduction of transcription costs is to directly involve physicians and transcriptionists in the change process from the beginning. Doing so not only ensures the best solution is implemented for a hospital’s unique dictation and transcription environment but also that these key stakeholders support the process. For Spectrum Health, having transcriptionists involved from the outset helped alleviate any fears regarding job security. It also reinforced the purpose behind transitioning to speech recognition, which was to increase productivity and reduce outsourcing costs.